Santa Barbara coffee beans take up to one year to mature on the tree, compared to the 6 to 8 months it takes in tropical regions. Several years ago, Jay Ruskey of Good Land Organics and UC Cooperative Extension farm advisor Mark Gaskell started an experiment to see how well coffee plants would grow in Santa Barbara County's temperate coastal climate, reported Sara Cole on the website Eat Drink Explore. After harvesting and processing the beans, they were pleasantly surprised by the results. 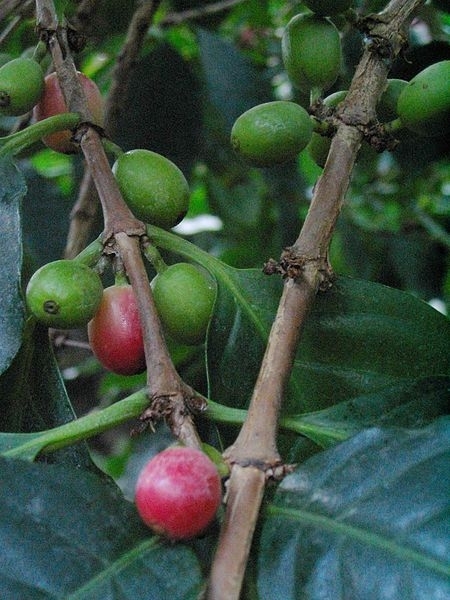 They found that coffee plants tolerate a temperate climate as long as they are protected from extreme weather like frost, wind and high heat. "Fifteen years ago this would not be feasible because most people were satisfied with Yuban or Folgers types of coffee," Ruskey said. "Now people pay 10 to 20 times more than those old prices for . . . unique cups of coffee that have a wide range of flavors from a variety of cultivation techniques." Ruskey sells the coffee at the local farmers market.